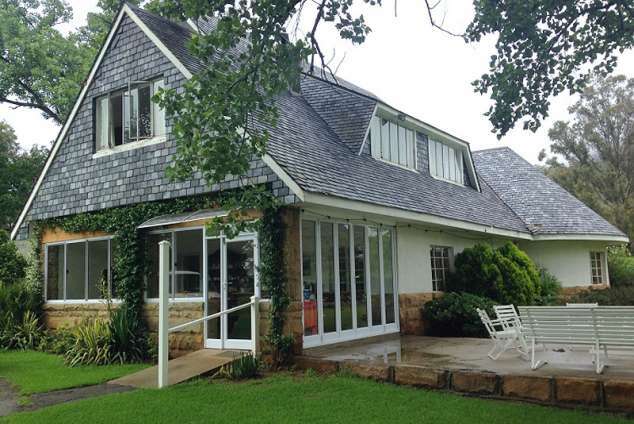 Woodcliffe Country House - Maclear Accommodation. Woodcliffe is one of the few places that offers comfortable accommodation in the Maclear area on a farm. Choose between the farmhouse, Castle View Unit and The Cottage, they are excellent base for exploring the natural wonders of the area. Tok's Cave and hiking huts offer rustic accommodation for hikers. Woodcliffe Farmhouse, Castle View Unit and The Cottage are situated in the valley bottom. They can be used as a base to stay whilst exploring the area. Woodcliffe offers some of the finest Drakensberg scenery in the Maclear area. The Cottage is secluded and stands alone 800m up the road from the Farmhouse. It has three bedrooms (1 x double, 2x twin) with one bathroom. There is a true sense of tranquility at the Cottage. The Little Pot River runs 50m away, making this Cottage every fishermans dream get-away. The Cottage does not have a TV, but with location and scenery no TV is needed. The Cottage has a Jet-master fire place to chase away the chill during the winter months. Castle View is a 40m2 unit, en suite with a kitchenette, boasting a beautiful king size bed. It has wall mounted flat screen with Full DSTV. The unit has beautiful north facing view of the mountains including Castle Kop. The bathroom has both a shower and a bath. It is situated near the Farmhouse but has a seperate entrance and exit and private garden area. Portable braai & garden furniture. Woodcliffe Farmhouse has 5 bedrooms (2x double & 3 x twin) with 2 bathrooms. The Farmhouse is usually used for large groups (5 people or more). The Farm House has Full DSTV and free WIFI. Guests staying the Garden Flat or Cottage are welcome to make use of the WIFI in guest area. The Farm House has a wood fire place in the main lounge and gas fire place in the dining/guest area. Camping: Woodcliffe has a camp area just outside the yard of the main farm house. It looks up the valley towards the Drakensberg. The ablution is a single shower, toilet, basin unit with a washbay adjacent to it. It has a single electricity point. All linen and bath towels are supplied (except for campers). Grids are supplied for braai-ing. Woodcliffe is not licensed to sell alcohol. Guests are required to bring their own drinks. For slack packers we have number of circular day walks start and finish at Woodcliffe. Enjoy the comforts of the farmhouse, garden flat and cottage each evening. For our guests who simply want a gentle stroll there are a number a flat easy walks to enjoy. For the fit and adventurous hikers we have trails that can be walked in a variety of combinations lasting from one up to five days. Please email us and we will put together a hike that will suit your ability. Option 1 Yellow circular walk across the foothills of 13 km (without backpack) which will include Redcliffe and Skinny Dip Pool. Option 2 Red Route approx. 16km which will take you past Tok's Cave and Wide Valley. Option 4 Walk along the valley bottom next to the Little Pot River and up to Tok’s Cave. There is also a 5 day hike which is not an easy trail and certainly not recommended for beginners, it traverses an area of spectacular scenery. The utter remoteness of its mountains and valleys gives the hiker a truly off-the-beaten-track experience. Tok's Cave situated under a large, deep overhang and offering a magnificent view, this cave is great for an over night stay. With dung floors and three small rooms built at its closed end, it has firewood and water. There is also a long-drop toilet nearby. Up to 20 people can overnight here. I have always fished the lower sections but a place with a great reputation for beauty and supreme fly fishing is Woodcliffe. This is the last farm on the road before the vast hinterland of the southern Drakensberg starts. The custodian of most of the other 1000km of fly waters in this area - is the Maclear Fly Fishing Club. There are numerous examples of San paintings in the mountains of Woodcliffe and the surrounding area. A collection San artifacts is on display at the farmhouse, this collection is listed with SAHRA. "For the rock was not simply a canvas but also a veil between the material and spirit worlds and paintings helped pierce that veil" - (National Geographic 2001, 122). Famous archeologists have visited Woodcliffe and Maclear and we are proud to have added some of them to our visitor's book: David Lewis Williams, Geoff Blundell, Sven Ouzman (see National Geographic magazine February 2001, for lead article) and Patricia Vinnecomb. Not all rock art is on Woodcliffe, prior arrangement is necessary for viewing of all paintings. Visits to the Kwa Bhaliwe site in the Tsitsana district may be arranged with the community. A local guide will accompany you to the village and site. Should you require the services of a guide to take you to rock art please let us know well in advance. All travelling costs are excluded from the guiding rate. It is assumed that guests would have their own 4x4 . Should Woodcliffe provide the use of a 4x4 it will be done on a per km rate. Guides are paid on a daily rate. Guests bring their own lunches or they may be arranged in advance. If the services of a guide are cancelled at the last minute the full guiding amount is payable. As Woodcliffe is situated 22km from Maclear and 60km from Naudes Nek we are a good stop over point for 4x4 enthusiasts trying the 12 pass challenge. We are 98km from Rhodes Village and 60km from Bastervoetspad. For those who are more daring and enjoy a tougher challenge Woodcliffe has 4x4 tracks heading past Tok's Cave up through spectacular scenery to the base of the Drakensberg. This track is alot more challenging and not for the light hearted. Wild flowers and orchids abound in summer. Hire a guide to take you to the orchid hot spots. Should you require the services of a guide to take you to the wild flowers , please let us know well in advance. All travelling costs are excluded from the guiding rate. It is assumed that guests would have their own 4x4 . Should Woodcliffe provide the use of a 4x4 it will be done on a per km rate. Guides are paid on a daily rate. Guests bring their own lunches or they may be arranged in advance. If the services of a guide are cancelled at the last minute the full guiding amount is payable. We undertake to give our guests an unforgettable holiday experience, with their safety as a priority. African Bulb Safaris by Cameron McMaster. From Maclear, head north on R96. After 13 km, turn left at dirt road. Follow dirt road for 8 km to end. 268 page views since 05 Oct, 2018.